Danish-French Impressionist painter Camille Pissarro was born on July 10, 1830 at St. Thomas Island (now part of the U.S. Virgin Islands). He was noted for his great contributions to the development of Impressionism and Post-Impressionism. He learned from the works of great artists such as Jean-Baptiste Corot and Gustave Courbet. He also studied and worked with French Post-Impressionist artists Paul Signac and Georges Seurat, when he got involved in the movement when he was 54 years old. He was the only artist whose works were shown during the eight Paris Impressionist Exhibitions spanning the years 1874 up to 1886. He was 43 in 1873 when he helped organize an artist society composed of 15 aspiring artists, becoming the group’s pivotal figure in keeping them together. He was called the “dean of the Impressionist painters” by art historian John Rewald due to his seniority among the members but mainly because of his wisdom and personality, which was described as warm-hearted, kind and balanced. He was like a second father to Cézanne and a master to Gauguin. His works were revolutionary, according to Renoir because Pissarro was a champion of the common man, painting them in natural settings without any grandeur or artifice. He not only became a father figure to many Impressionist painters but also to the major Post-Impressionists, including Vincent van Gogh and Georges Seurat. He met Fritz Melbye, a Danish artist living in St. Thomas when he was 21. He inspired Pissarro to be a full-time painter, and Melbye became his friend as well as his teacher. They went to Venezuela and for the next two years they worked as artists in La Guaira and Caracas. Pissarro was an eager student and artist, and took every chance he got to draw village scenes, landscapes and more. He did numerous sketches as well. In 1855 he went back to Paris and worked as an assistant to Fritz Melbye’s brother, Anton Melbye, also an artist who specialized in marine painting, whose style was described as belonging to the Romantic Movement. It was at this time that he seriously studied the works of landscape and portrait artist Jean-Baptiste Camille Corot, Jean-François Millet, Charles-François Daubigny and Gustave Courbet. He later enrolled in classes at the Académie Suisse and École des Beaux-Arts where masters taught but he soon found their style quite stifling and sought training from Corot. His early paintings in Paris were in the style that conformed to the standards set by the Paris Salon, influenced by Corot. They both shared a love of rural scenes and painted en plein air. According to art historian Rewald, Pissarro found the works of Gustave Courbet and Corot as “statements of pictorial truth” and also admired how Jean-François Millet depicted rural life in his paintings. He had been in Paris for one year when he started to appreciate and understand the importance to unadulterated renditions of nature’s beauty. He went outside the city and discovered the picturesque countryside of France. Pissarro’s mentor usually completed his scenic paintings in his studio, usually revising his work based on his preconceptions. On the other hand, Pissarro completed his paintings outdoors, at times in one sitting, which gave much more realism to his works. 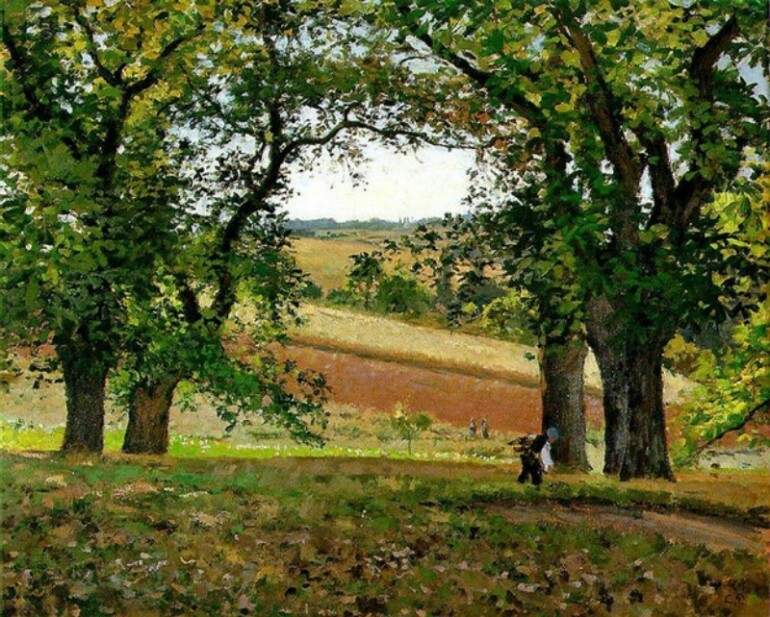 By 1868, Pissarro had built quite a reputation as a landscape artist that could rival Charles-François Daubigny and Corot. By the late 1860s or the early part of the 1870s, Pissarro was fascinated by the beauty and compositional unity of Japanese prints and wanted to try new compositions, as he told Lucien, one of his sons. He moved his family to England when war broke out. He managed to paint while in England although his painting style, which was a precursor to Impressionism, was not well received. However, his stay in London allowed him to meet Paul Durand-Ruel, a famous art dealer who helped his with the sale of his paintings while he was alive. Durand-Ruel connected him to Claude Monet and the two met and viewed the works of J. M. W. Turner and John Constable, which strengthened their belief that painting outdoors gave the most realistic depiction of atmosphere and light, leading to Pissarro experimenting with brushstrokes with very loose blending. After the war he returned to France and found out that only 40 of his 1,500 paintings, a collection that spanned 20 years, were left. Most were destroyed and used as floor mats by the soldiers. It was assumed that many of those paintings showed the Impressionist style that Pissarro was developing. He quickly reestablished his earlier friendship with the younger artists that formed the core group of Impressionist artists, including Degas, Renoir, Manet, Monet and Cézanne. They formed the “Société Anonyme des Artistes, Peintres, Sculpteurs et Graveurs” in 1873 and he became the de facto leader of the group of 15 artists. 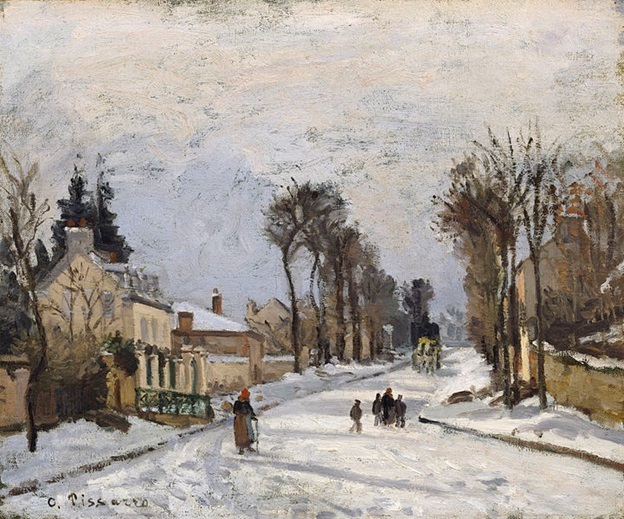 Pissarro was ready to explore new painting methods and new themes by the 1880s and went back to painting rural scenes. With him leaving the group, it signaled the end of the Impressionist period. Upon meeting Signac and Seurat, Pissarro earnestly studied their technique, called pointillism for three years and while he created some canvases in this style, he soon abandoned it because he found it too artificial and went back to painting landscapes in his own style.